And, of course, at the end of every journey we’d return to our own uncontrolled, unmanned field, look at our own somewhat sad terminal, and complain that we weren’t measuring up very well. We’ve been doing that since 2013. Over the holiday break Lisa decided to quit complaining and start doing. She showed up at our house with a pad of paper and a pencil to grill Rio and I about things we saw at airports that we liked the most, and things we saw at airports that we liked the least. The bathrooms at that place in Oklahoma were disgusting. The popcorn at Dodge City is pretty darn good. Too many airports don’t have a courtesy car to get into town. The self-serve oil system—take a quart and slide a fiver under the door—at Twenty Nine Palms was Godsend. Dead bugs covered the windowsills at one south Texas airport. The coffee at Batesville rocked the house. There was no light in the bathroom at spooky airport somewhere in the Midwest. I loved the old 12-foot-wide wall planning chart at Herford. De Queen had wanted posters on the walls of the terminal. The computers were great at Belle Plaine, as was the selection of help-your-self snacks. And Smiley Johnson Municipal had a riddle you had to solve to reveal the code to the locked terminal door (we never solved it). I figured it was all just an intellectual exercise, but the next time Lisa, Rio, and I went to the airport for some flying, Lisa went to the dollar store while Rio and I were up. When we landed there was a bottle of mouthwash and little Dixie cups in the bathroom, a pile of snacks on the countertop, and cold water and sodas in the fridge. Lisa’s airport terminal renovation had begun. Drinking the newly purchased cold water in our very own home terminal, we sat on the cigarette-burned sofa and looked around us critically. The little building has good bones. It isn’t even all that old. It has excellent heat in the winter and wonderful air conditioning in the summer. But it has sad and disorganized furniture, including a massive industrial literature rack featuring years-old aviation magazines, some yellowing with age. The tile floor is an unfortunate design. Even if clean, it would still look dirty. What could we do? Well, what about some area rugs to distract the eye from that tile? Some art would go a long way in the bathroom. And maybe some curtains on the window to mask the fifth wheel trailer of the state cop who lived next door to the terminal on some sort of security-for-rent trade that ended up having his doghouse and cars block the view of the windows that used to look out onto the runway. 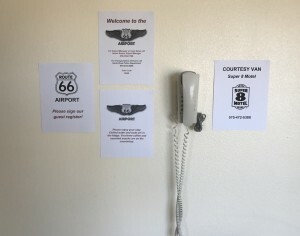 Surrounding the courtesy phone on the wall were old clip-art decorated signs with important local contact info, some of which had changed, with the changes noted in black magic marker. There was also a sign touting the free internet, which has been broken down for about two years. I decided to replace them. Upping the ante, I whipped out my iPhone and ordered a one-shot coffee maker that uses pods for quick and easy cups of coffee on demand. Next we re-arranged the furniture, got some paper towel holders, and covered the cigarette-burnt sofa with a serape. 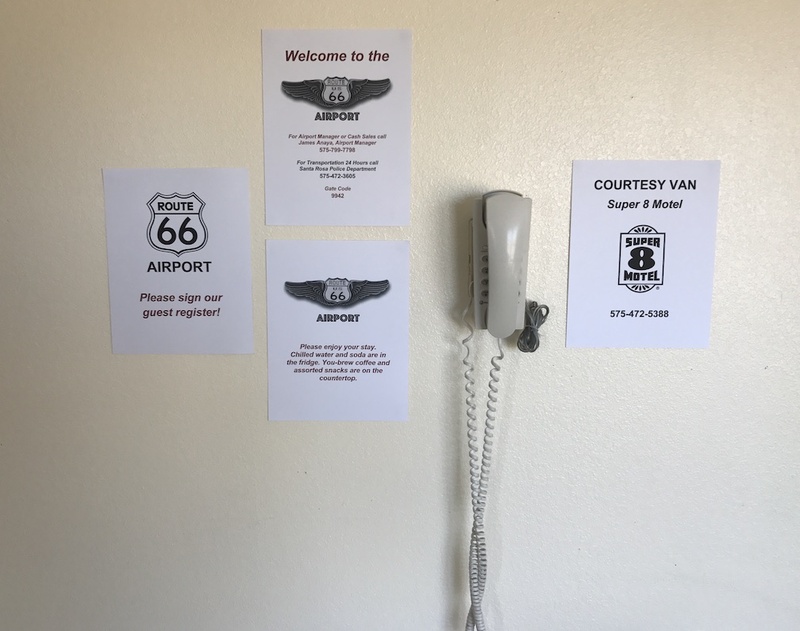 Then we started kicking around some Route 66 artwork, as our airport is called the Route 66 Airport because our east-west runway was originally a stretch of the famous roadway before the interstate bypassed it and the city turned that unused stretch of highway into a landing strip. It was baby steps, but it was transformative. At each visit we’d bring something new along. And at each visit, the terminal felt more inviting every time we walked in the door. One day when we were hanging the new sheer curtains from Walmart, the part-time airport manager walked in. He’s a great guy, but he wears something like five hats for the city, so the airport is only one of many responsibilities for him. “Holy cow, this place looks great,” he said, staring around in wonder. We fessed up that Lisa had adopted his terminal. Remember last week when I told you that, as always with airplanes, there was a problem? 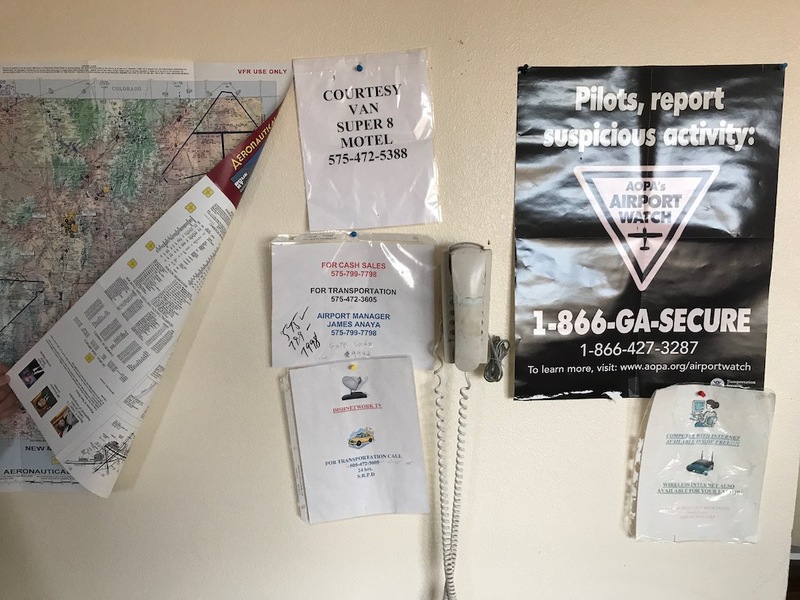 Well, at risk of turning Plane Tales into the aviation version of Bob Vila’s This Old House TV series, today I have yet another Plane Problem tale. It all started when we bought the airplane. No really, today’s feature attraction is one I’ve known about, and have been putting off, since 2013. But before we can dig into the latest money-eater, for background you need to know that Tessie has three fuel tanks. There’s one in each wing, which is where airplane gas tanks are normally found. Somewhat uniquely, Tess’s are interconnected with no fuel selector, making the pair act like one large gas tank. Even more uniquely, there’s a fuselage tank in the nose of the plane between the engine and the instrument panel. This makes some people nervous, with all that gas in their laps, but in truth, all airplanes are just flying gasoline bombs anyway, so it’s never bothered me. 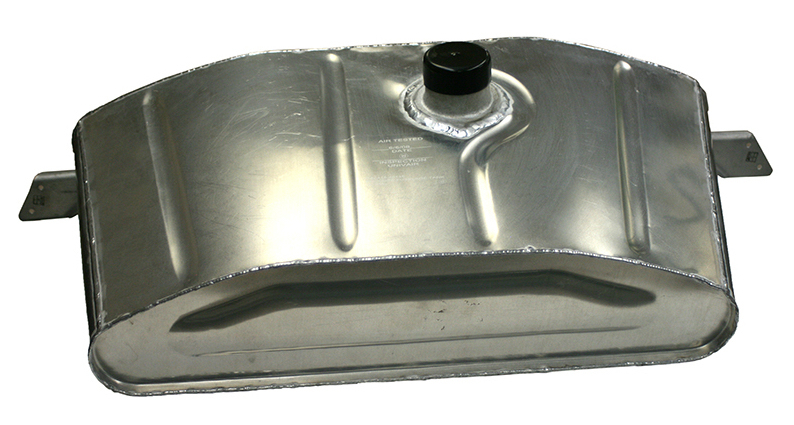 In fact, I regard my fuselage tank as a great safety feature due to the way the entire fuel system is designed. Here’s the deal: An engine-driven fuel pump draws gas up from the conjoined wing tanks and into the nose tank, which I generally call a “header” tank. Gas is then gravity-fed down to the carburetor. The fuel pump draws more gas than the engine uses, and the header tank has an overflow tube that leads back down to the wing tanks again. Think of it like one of those chocolate fountains you see at weddings. 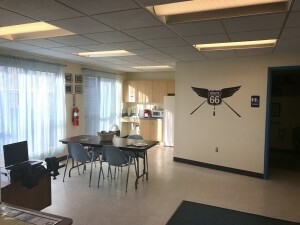 What makes this arrangement safe, or safer than virtually any other low wing airplane, is the fact that the engine doesn’t need the fuel pump to run. 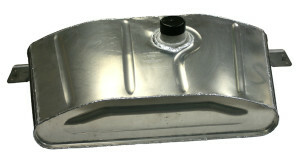 If the fuel pump conks out, the header tank can keep the engine running for an hour. In other low wing planes, if the fuel pump kicks the bucket, the engine shuts down (which is why many planes have backup fuel pumps, but I’m a great believer in catastrophic chains of failure). So speaking of gas, pretty much since day one—or maybe it was day two—there’s been a slight odor of gas in Tess’s cockpit. My mechanics checked all the usual suspects, looking at the priming system, checking the fuel cutoffs, and making sure all the various connectors were well connected. Looking closer, in every nook and cranny, they finally discovered the cause: An itsy bitsy fuel seep. 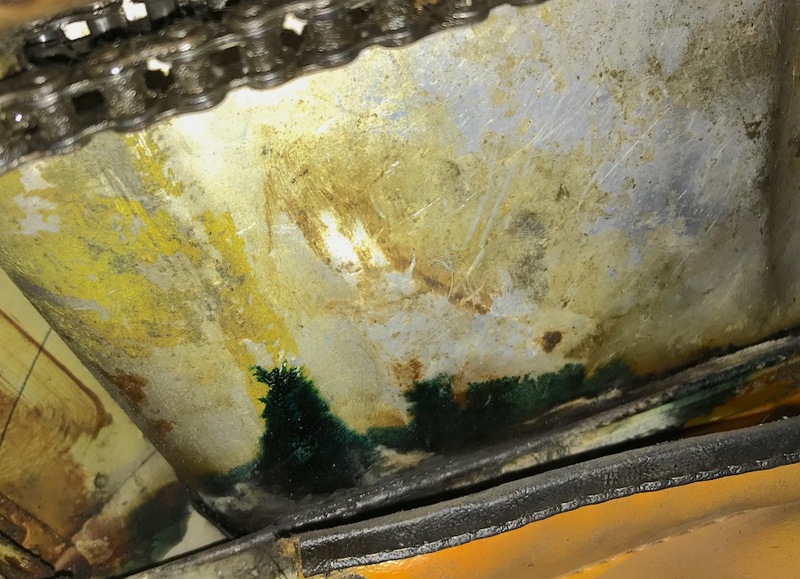 The header tank was oozing fuel. As pulling out the header tank pretty much entails gutting the interior of the airplane to remove it (or so we all thought at the time), which would take a ton of time, and therefore cost me a ton of money, my mechanics had little trouble convincing me to put this off. Sure, when you first opened the canopy when the plane had been sitting for a while, there’d be a whiff of fuel, but it quickly dissipated and wasn’t an issue. Once we got Tess back from her months-looooong engine misadventures, I noticed that the fuel smell was worse. Much worse. When opening the canopy, a nauseating wave of fuel fumes poured forth. On our return flight from Texas on our engine break-in flight, I got a pounding headache from the fumes. When I took her in for her new engine’s first oil change, at ten flight hours, I insisted that my mechanics investigate. Meanwhile, the smell was now so strong I wondered if gas were dripping out and soaking into the carpet. My guys suggested I cover the floor with white paper between flights to see if the paper was stained when I came back. Still, I knew the fumes had to be coming from that damn tank, somehow. And that, all evidence to the contrary, things were getting worse. I also kicked myself for not insisting that the tank be pulled and rebuilt during the long downtime of the engine rebuild. I vowed to get it taken care of once and for all at our next annual, which due to all the work that’s been done, has now been reset to the month of May. It’s never a good thing when an airplane mechanic wants you to see something. Like a condemned man being led to gallows, I followed him around Tess’s nose to the pilot side. The mechanic pulled out a black flashlight and played a bright beam on the firewall. A long blue stain wandered down the slick metal. Blue… Blue is the color of the only remaining aviation fuel in the U.S., called 100 low lead, or sometimes 100LL. Why is it blue, other than the fact that its cost per gallon gives pilots the Blues? Well, back in the day when aviation was healthier, there were many kinds of airplane gas. There was 80 octane, the 100 octane, and even a 130 octane. Various engines ran better on one or the other, and with that many gasolines available, there was always the risk that some fool line boy would put the wrong juice in your tanks with possibly tragic results. Thus, each kind of gas had its own color so you could tell if you had the right or wrong go-juice in your bird’s tanks. Eighty was red, 130 was green, and the 100 was blue. The blue stain was telling us that the seep was no longer a seep. It was a… Well, I don’t know what to call something that’s more than a seep but less than a trickle. But it wasn’t a good sign. Next the mechanic crawled under the dash to look at the bottom of the header tank from inside. This isn’t an easy thing to do in an Ercoupe. He lay on his back on the seat, head under the dash, legs and feet dangling out the window. “Can some one get me my phone?” his disembodied voice floated out of the cockpit. Odd time to choose to make a phone call, I thought, but I fetched his phone from his workbench. It turns out he wanted to take a photo. Massive stretches of blue were staining the underside of the tank. OK, well, massive is an exaggeration. There were two or three stains the size of postage stamps. But they weren’t there a month ago. But that wasn’t half of it. Not by far. Along the base of the tank, where it rests on a bracket on the inside of the firewall, was liquid gasoline. I guess my seep just became a spring. In just a hair over a month. The tank job couldn’t be put off any longer. I asked my senior mechanic if the outfit that rebuilt our wing tank this spring also rebuilt header tanks. “I don’t know,” he replied, “but given how hard it’s going to be to get to, maybe you should consider a new one.” Then he asked if I happened to know if Univair sold new ones. Univair, a company in Colorado, should really be called Uni-savior. They hold the Type Certificate for the Ercoupe, and although they’ve never made a single airplane, they continue to make almost every part and piece of the planes. This is why Ercoupe owners, unlike owners of other classic planes of yesteryear, don’t need to own three planes to keep one flying: Virtually every replacement part we could need can be on a UPS truck within 24 hours. Because while Univair can make anything you need, not everything you need is always in stock. Still, better to wait six weeks than spend a lifetime searching airplane junkyards. Standing in my mechanic’s hanger next to Tess I could almost hear the gas dripping onto the floor. Which it wasn’t. Other than in my writer’s imagination. I pulled out my phone and checked Univair’s website. There it was, the header tank, all $2,180.87 of it. Seriously? Eighty-seven cents? Why not just round it up to twenty-two hundred bucks? Then I flew my leaky plane south to the prop shop, wondering if I’d ever get away from fixing this plane and back to just, you know, flying it. So… did I choose 47 or 48 at the prop shop? It turns out it can be pitched to 47.5. Who knew? With that problem solved, I set about working my contacts for advice on how to pull the header tank out of the plane without completely disemboweling the cockpit, as it turns out that neither of my mechanics had ever done it. Luckily, for Tess’s version of her breed, it’s not too bad a procedure after all. The yokes come out. Various cables get disconnected, then the tank is disconnected and pretty much drops straight onto the floor, where it can be pulled out of the plane. At first glance my guys thought that the entire instrument panel and all its toys would need to be removed, but that’s not necessary. So that’s good. Well, other than the timing, of course. Over dinner and lots of wine at the end of the very long day, I was filling the family in on the latest debacle. When I finished, I wrapped up with a hopeful thought from one of my mechanics: At this point we’ve replaced or refurbished virtually every system on the airplane. It’s more of a 2018 Ercoupe than a 1947 Ercoupe. With a strong new power plant on the front and all major systems in ship-shape order, there would be nothing but routine maintenance to worry about going forward. My mother wasn’t buying that. Not for a second. “I’m sure something else will break down next,” she snorted. Maybe so. But I hope not. I’ve got my fingers crossed that it will be a long time before the next episode of This Old Airplane airs on the Plane Tales Network. This year, as more and more things are available online, we probably did 80%, or more, of all of our holiday shopping online, and this led to a unique problem: Lots of boxes were showing up at our door. Why was this a problem? Because it wasn’t always clear who should open any given box to avoid spoiling a well thought out surprise. Is this the bow tie I ordered for Rio? Is it something Debbie ordered for me? Or is it just the coffee we ordered for the Keurig? 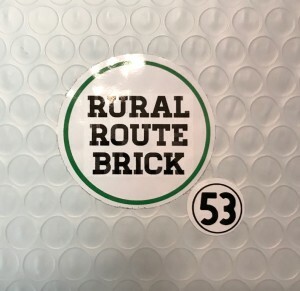 When she got home, she reported she also didn’t recall ordering anything from Rural Route Brick, but as she’s more of the last minute shopper than I am, and I was pretty sure that I had accounted for all I had ordered, I had her open the box out of my eyesight. Opening the box didn’t solve the mystery. Inside, there were two white plastic padded envelopes. Debs brought them to me in the library where I was writing a pitch to Flight Training Magazine on when not to file a flight plan. 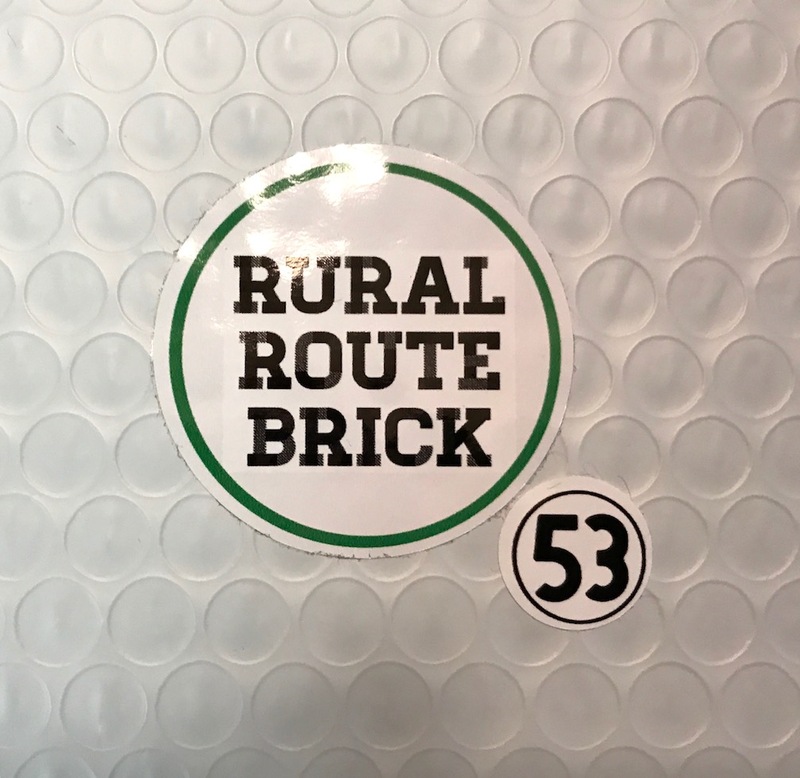 Each envelope had a large round Rural Route Brick sticker, and a smaller Race 53 gumball. 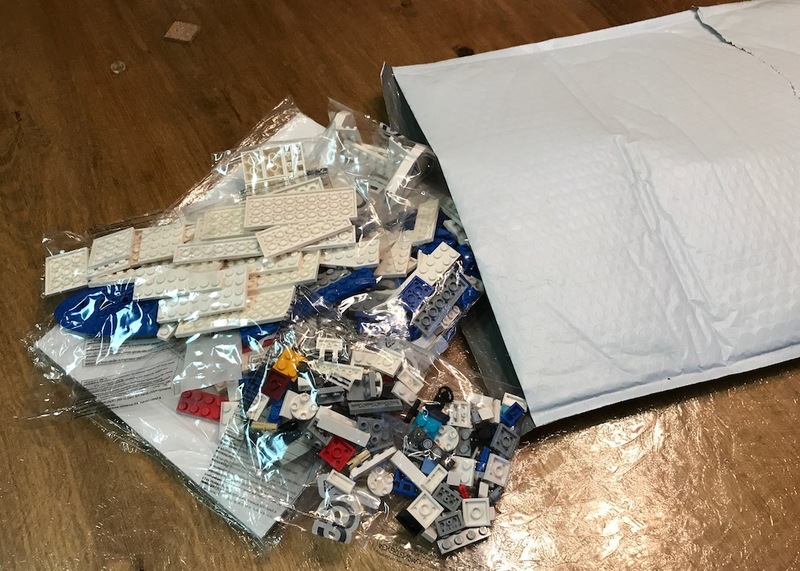 She handed me one of the envelopes, and as it passed into my hands I heard the unmistakable sound of Lego bricks clinking against each other. Suddenly I broke from the clouds and had the runway in sight. Lego Tessie had finally arrived. 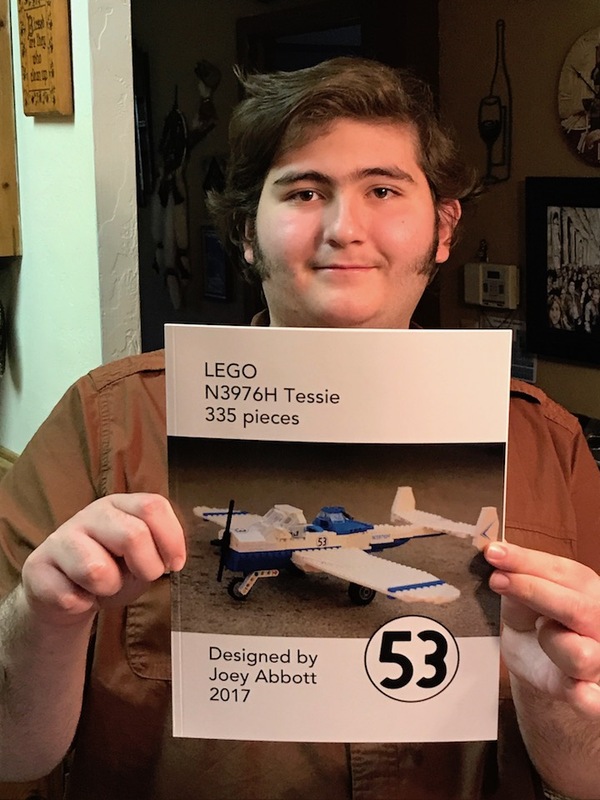 Waaaaay back in December of 2015, an article appeared in Coupe Capers (the Ercoupe Owners Club monthly newsletter) about a Lego and Ercoupe enthusiast named Joey Abbott. He had created an Ercoupe model out of Lego bricks and had submitted it to the Lego Ideas website. 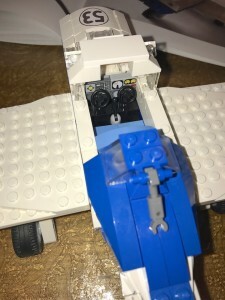 Apparently anyone can submit a design to the site, and if it gets 10,000 votes from the public, Lego will consider it for production as an official set. Naturally I voted for the Lego Ercoupe the same day I read about it. Then I wrote the designer and told him how cool I thought it was. I also asked if I could buy one from him. That was a no-go, as the Lego rules don’t allow designers to sell models under consideration, but Joey and I stayed in touch anyway. Sadly, his original design didn’t get the votes it needed in the time window allowed, but that put his design on the open market and we were able to strike a deal. 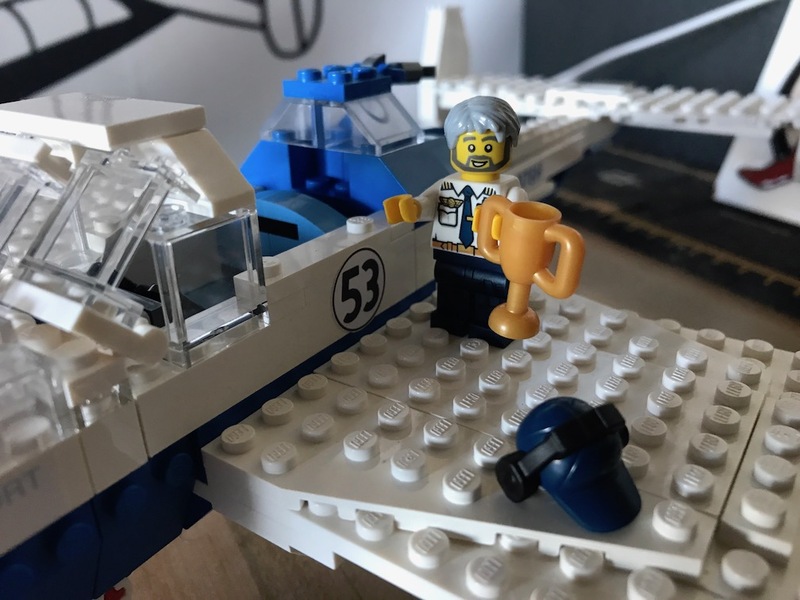 The design as featured on Lego Ideas was a handsome grey-body yellow-wing affair, but in the ensuing time Joey had become a Plane Tales fan and he sent me a rotatable 3-D computerized version of his original model in Tessie livery. It blew my mind. And I didn’t get any work done for the next two weeks ‘cause I was too busy playing with the computer model. In no time I decided I needed two: One for home, one for hangar. Anyway, the project dragged on for what seemed like forever, but that’s only because I didn’t really understand what went in to it. More on that in a bit. Occasionally I’d get an email from Joey with a question, and occasionally I’d email him to see if he was still alive. At one point, he sent me an image of the prototype being held in someone’s hands. It was huge! I knew the model was an exact 1:19 scale, but I had no real sense of how darn large that it really made it. For some reason, looking at the computer images and the photos of the models, I had envisioned it much smaller. 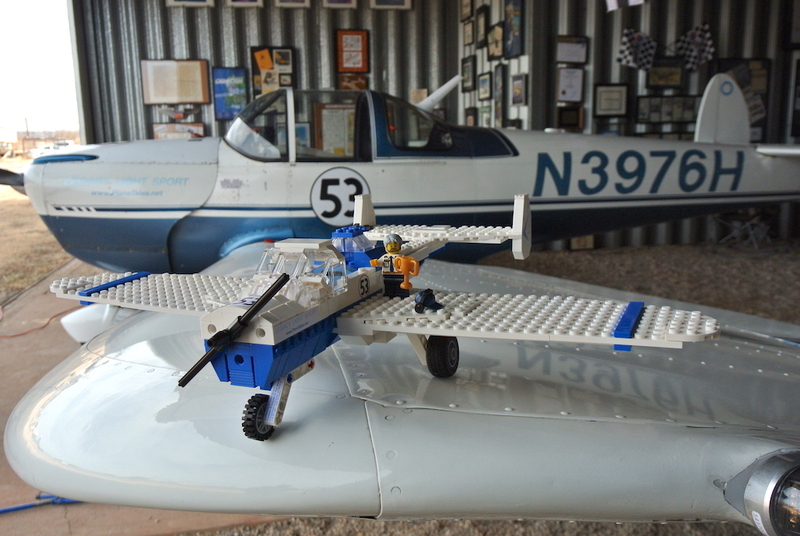 His original prototype Ercoupe model was constructed in “Lego camo,” a mishmash of crazy Lego colors where shape alone rules the day. 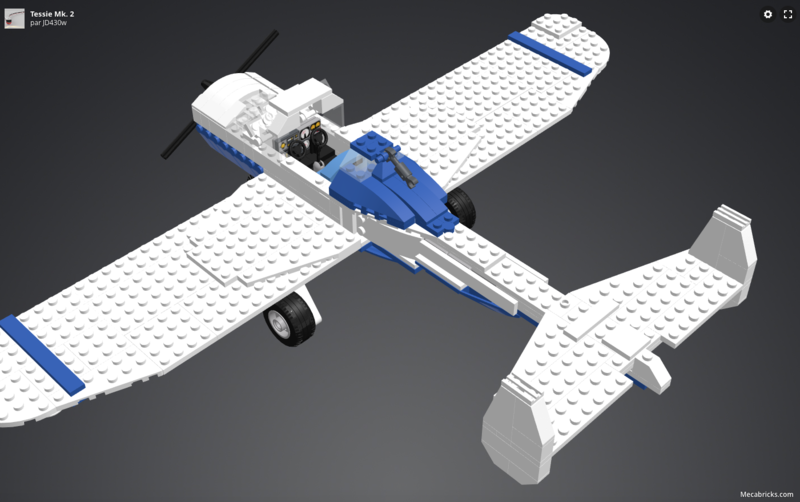 Once this camo prototype was built, he transferred the design into an online Lego CAD program, where colors can be adjusted to match the myriad of Lego brick colors that are available for each brick. 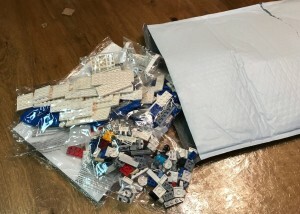 Then the hard part begins: Sourcing the individual bricks via Bricklink, which is sort of an eBay for Lego bricks. 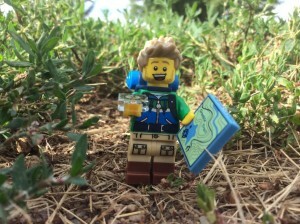 Who knew there was an entire Lego subculture? The bricks for my pair of Tessies came from Holland, Germany, Czechoslovakia, and the UK. Designing the instructions was another challenge, apparently, and took nearly as long as getting the parts. I’ve actually short-changed the process somewhat, but Joey lays out the whole operation on his excellent website here, and it’s well worth the read. But not until you’ve finished this Plane Tale! Anyway, the two envelopes of bricks arrived on Christmas Eve Eve Eve. And on Christmas Eve Eve, Rio and I set to work to build the first one. 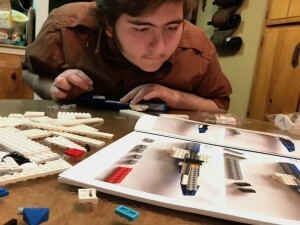 We used to build a lot of Lego together when he was younger, but he seems to have largely lost interest in the fascinating but vexing brick creations. But having a Lego model of his airplane was another matter altogether. Also in the envelope was a beautifully bound instruction manual. All 54 pages of it, detailing 104 steps to turn the 335 Lego pieces into our airplane. Figuring out how to create the construction manual apparently gave Joey a bit of a headache. Traditional Lego instructions are part architectural drawing, part hieroglyph. Joey’s solution was to photograph each construction step with the bricks for the next step in each picture, and then lay them out two to a page in the construction manual. It worked just like the “real” thing, meaning that at least three times we had to go back, disassemble, fix a mistake we made, and then move forward. Rio was the assembly master; my job was that of parts gofer. 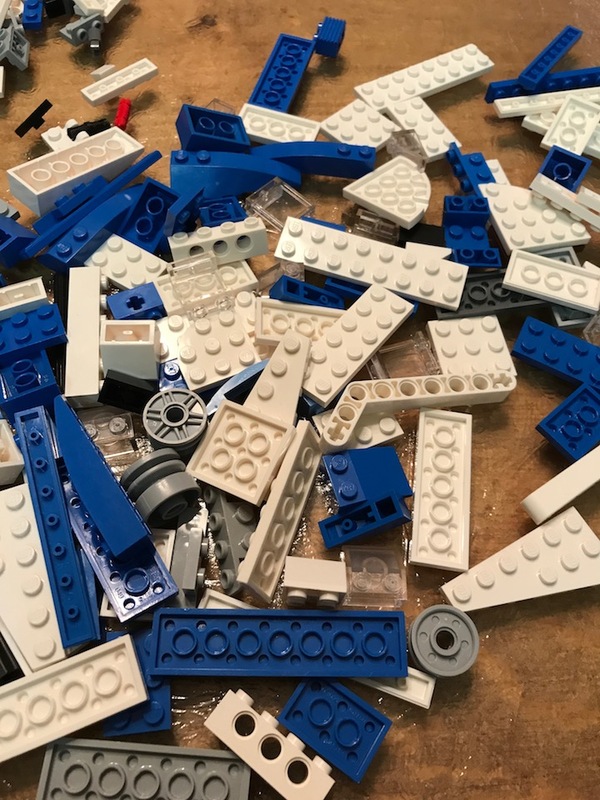 As in production Lego kits of any complexity, one of the big challenges is telling the difference between similar pieces, especially the long flat types. I had to use a pencil to count how many nubs long some of the pieces were to tell the difference between a grey flat that had two rows of eight numbs vs. the ones that had ten rows of nubs. Or twelve. Then it happened. I couldn’t find the bricks for the next step. We searched through the piles and sacks. No joy. Now what? 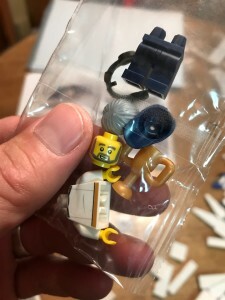 I figured that as Joey had packaged up the two plane kits at the same time, maybe two identical sacks of parts got put in one envelope. I went to fetch the second kit. In the meantime, Rio had the presence of mind to check the first envelope again, and sure enough there was a bag of parts that remained behind when we emptied out the package onto the kitchen table. Just to make sure we now had them all, I reached all the way to the bottom of the envelope and found yet another packet of parts. It was small. Drawing it out I saw it had all the parts of a Lego Minifigure. A pilot. A pilot with a beard, gray hair, blue hat, and a headset. He also had a gold trophy. Holy cow! 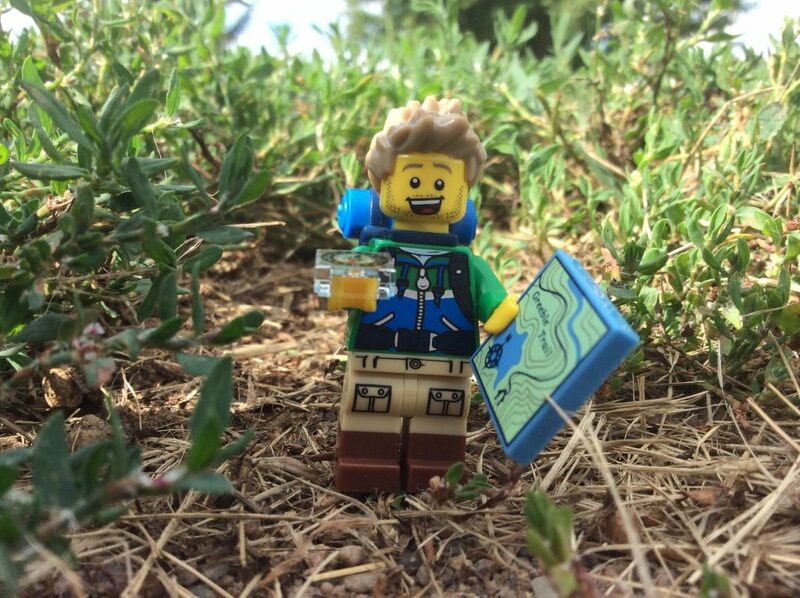 I had been turned into a Lego Minifigure! It was a complete and total surprise. And a wonderful one. As the model took shape, my mind was repeatedly blown by Joey’s attention to detail. The model had Tessie’s URL nose art. The side had her N-number. Her belly her beacon. A tiny sticker attached to the front strut touted our World Speed Record, the exact same text that appears on Tess’s front wheel pant. There was a complete instrument panel, dual yokes, and even her center-mounted throttle. It took us most of the afternoon to complete the Lego Tessie, but it was one of the best afternoons ever, and absolutely the best Christmas Eve Eve of all time. 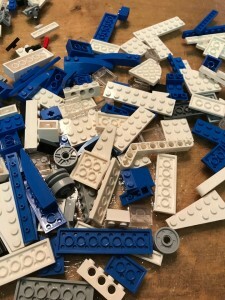 But in the end, when we were finished, just like with every production Lego kit we ever made, there was one brick left over. Awe, hell. We messed up somewhere. 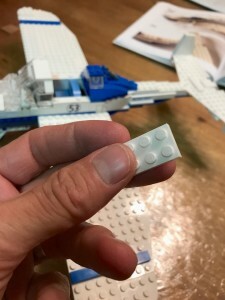 We briefly debated just dropping the wayward brick on the floor and forgetting about it, but decided that given all the effort that went in to creating the model that would be just… wrong. Back we flipped though the manual, until we figured out where the part went. We disassembled several steps, put in the wayward brick, and as the sun set, re-assembled Lego Tessie. Then we broke out the eggnog and sat admiring our (and mostly Joey’s) handiwork. 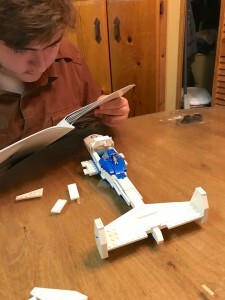 I’ve always been amazed at the objects that can be made by Lego, but building a Lego model of something I know and love so well in real life was an amazing experience, beyond a doubt my best non-flying aviation adventure of all time. Plus, when something breaks down on this Tessie, it will be an easy fix, just snapping the bricks back together! Be sure to check out his impressive Messerschmitt BF 109. 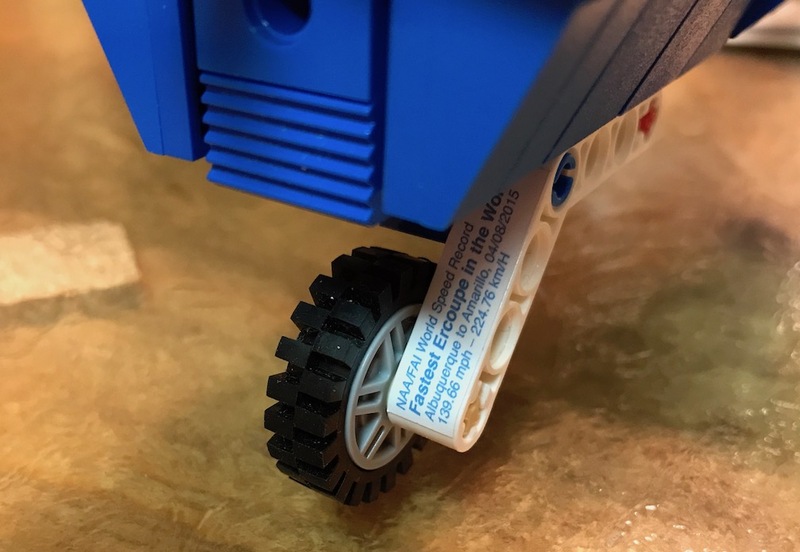 He even nailed the funky landing gear and the model’s gear is retractable… just like the real thing! And if you like your Lego on the large side, his B-25 Mitchell bomber used an estimated 1,700 Lego pieces and weighs in at four pounds!! !